How do you like having the FF next to you, instead of in front? Is it easy and comfortable to read, or is it annoying to have to turn your head to look? I love having it there. I can also move it forward to the mounting board if I want. I've found it to work very well where it is though. Can you tell me what the spacing of the PVC tubes is? I can't find anything describing the distance between the channels on the hull of the PA12. 'preciate your efforts and your help! My set up is very similar to ckossuth. HB 596 di mounted on the rail with a 12in yakattack geartrack w/ a RAM mounted transducer arm. 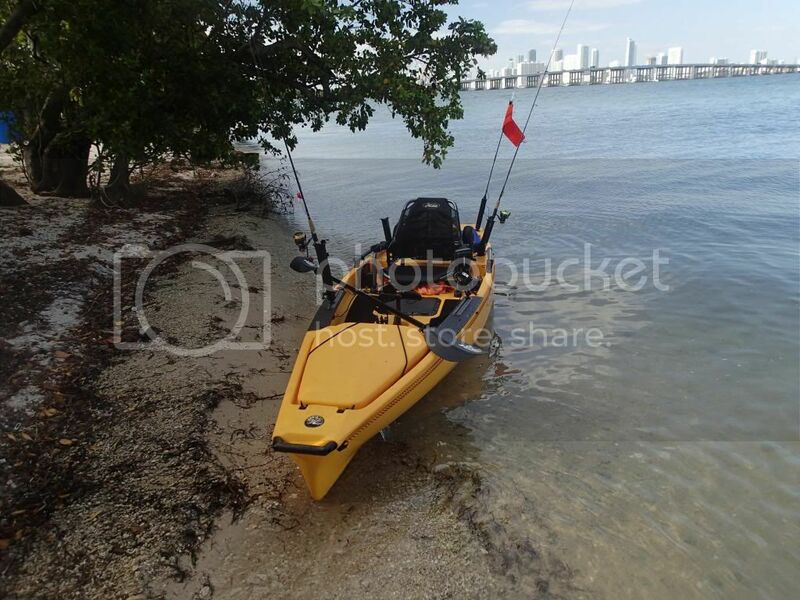 Equipped with adjustable RAM 2008 tube up front, two Hobie tubes in the back, Hobie branded VisiCarbon Pro II flag seated in a flush scotty mount. The Evolve motor is tucked in the hatch. I just added a rail mount for the Evolve computer. 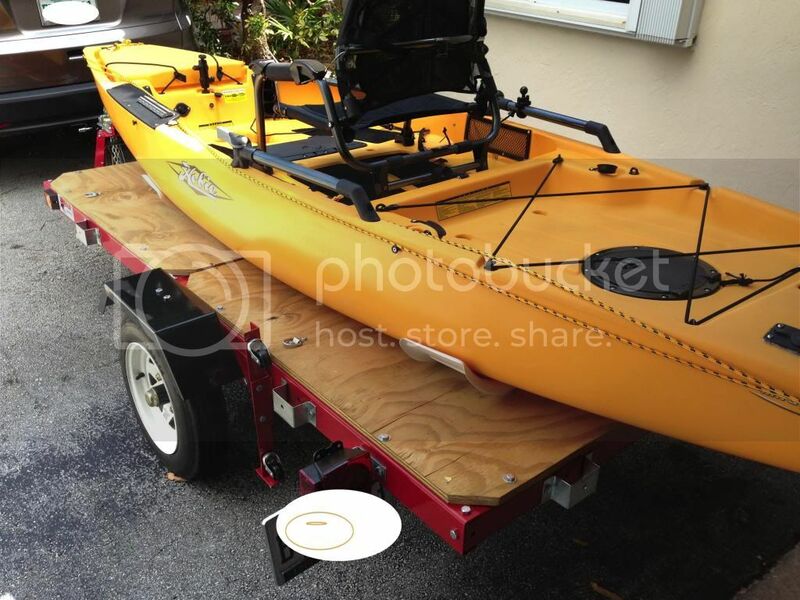 The accessories in the front are mounted to the long Hobie branded YakAttack tracks. Just under the Ram camera sail mast mount is the plug for the Evolve motor. 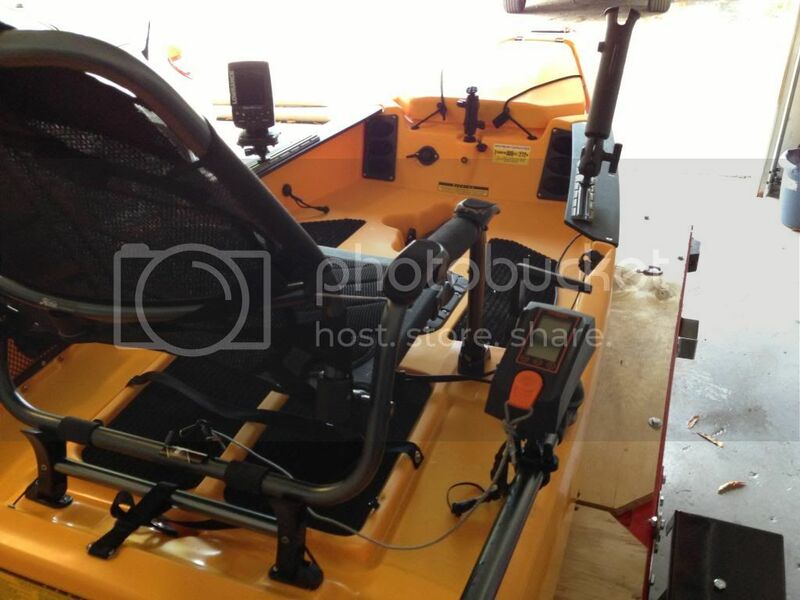 I used velcro to secure the Hobie large fish finder battery under the seat. I haven't had to re-charge it yet but it's easy to take out. I planned to charge it in the yak but the battery gets hot to the touch. The Torqeedo/Evolve battery behind the seat; I removed the foam on the side and slid it into the back.. I can reach all the cables through the rear twist n straw hatch; I charge the battery in the yak.. it stays cool unlike the fish finder battery. I stuck some soft foam to prevent it from movie around during transport or rough seas. It used to sit on shipping tubes (type fishing rods are mailed in) but I just finished installing the Hobie Cradles on the trailer. Truth be told I feel like the cradles aren't worth the $200.. they feel and look cheap. The card board shipping tubes felt more robust and sturdy. The yak barely sits off the flat bed..in the middle it virtually touches the flat bed. It does reduce the forward and backward movement and side to side is stopped.